It’s only due to blessings of sophisticated technology that human life has been turned completely with use of latest gadgets around us. Just like human beings have been transformed from a traditional forming role to the era of today science and technology, different inventions with the time has made the things possible for us. Inventions may not prove as much useful for us as we are not known to their features and benefits, but with latest awareness campaigns, we have achieved the substantial knowledge and information about new technology and it’s prospective. If you have wrongfully get up on Monday morning from your bed, than this aXbo alarm clock is there to monitor your daily sleep patterns and help you wake at optimum time in the morning. All the other alarm clocks and bedroom gizmos which are used nowadays will just look the scarp after checking this sophisticated alarm clock. AXbo’s alarm clock claims to wake you up at your optimal morning time and best to save from your unusual late waking up patterns. You will wake up with refreshed alarm clock sound, thousands times better than rattling sounds of other ordinary alarms and claimed as best sleeping patterns monitor by the company PR blurb. 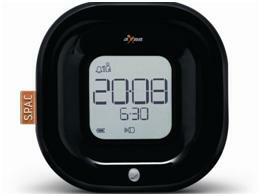 This alarm clock is equipped with latest technology of learning the human patterns and detecting where in sleep pattern a user is, to wake him or her at his right waking time in the morning or other day time. It also assist the users to wake up naturally with unusual sleeping patterns at evening time or after the lunch as opposed to deep sleep. The use of eco-friendly gadgets is increasing day by day and companies are investing more with such eco-friendly gadgets which are proven to benefit the human beings at most. While traditional alarm clocks make more than enough noise while waking you, this new aXbo sleeping phase alarm device does the things in new style. It has been embedded with an innovative design and functionality to check whether you are sleeping at the start in night or near to wake up in the morning. This device is also using moment sensors which check the body movements to learn about waking time of a person and continue reading with best human sleeping patterns. You will find this new aXbo unit two sensor units inside the box with two wristbands and power charging plugs. Also you will receive a plenty of information user manual.